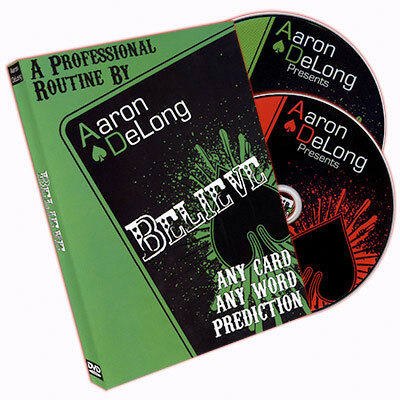 Aaron DeLong is one of my favorite magicians to hang out with. He is always looking to push his magic further and that's exactly what has happened with Believe. He originally released the trick several years ago and received a great reaction from his customers. But for a long time, it was unavailable. Now it's back with a vengeance. In effect, someone selects a card and thinks of any word in the English language. Using some pseduo cold reading, the magician then reveals the name of the selected card. He then takes it further by bringing out a sealed envelope and shows that it contains a playing card, which perfectly matches the selection. But then things get even weirder ... the magician shows that the participant's freely named word is written on the back of the card. It's an incredibly fooling trick and is something that you will love to play around with. On this two-disk compendium, Aaron teaches several versions of the trick, along with contributions from Paul Vigil, Jason Dean, Brandon Williams, Marty Miller, Tony Miller, Christopher Williams, and Cody J.H. Pace.